Eczema is a common yet incurable skin condition characterised by very itchy dry inflamed skin. It is not contagious. The recurring cycle of Eczema makes it hard to control. It may seem to completely heal at times. However, often it will return at random or as a result of environmental or bodily triggers. Eczema is often found in children under the age of 5. Around 75% of children that suffer from Eczema will carry the condition on into later life. Conventional treatments often involve steroid based creams that only help to temporarily mask the symptoms. Luckily, as with most common health issues there are a number natural options and remedies that can help you and your family avoid the use of cosmetic and pharmaceutical chemicals. Whole areas of the skin become red and inflamed. Inflamed skin is itchy. Often this can become very intense. A repetitive cycle of rash, blistering, weeping and crusting over and healing. Hydrogen Peroxide(H2O2)is a simple solution of water with an additional oxygen molecule, thus giving it the chemical structure of H2O2. A vast number of people suffering from Eczema who have tried H2O2, claim to have benefited greatly from the use of this versatile remedy. The most common application involves adding around 150ml of 35% food grade hydrogen peroxide to bath water before a soak. You may feel a slight bubbling sensation at first but this is completely normal and is just the result of the oxygen separating its bond from the H2O2 to form H2O (plain water). 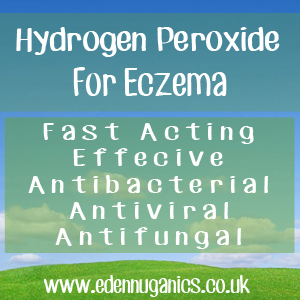 The antimicrobial properties of Hydrogen Peroxide help to disinfect any areas of broken skin as well as promote new cell growth. Magnesium Baths - Often soaking in a hot bath for a long time can irritate the skin of people suffering from eczema. Simply adding Magnesium Chloride flakes to the tub can be a great way to reduce this issue. Magnesium helps by relaxing and loosening muscles throughout the body. It is absorbed into the body through the skin via a transdermal action. Coconut Oil - Yes, yet another use for this versatile saturated fat! Coconut oil contains a plethora of antimicrobial properties (antifungal, antioxidant, antibacterial) that help to soothe the intense itching often associated with eczema as well as reduce inflammation. Coconut oil also contains medium-chain fatty acids that help to restore the protective layers of the skin and promote regrowth. Apple Cider Vinegar - Apple cider vinegar is a very popular remedy when treating Eczema. Like coconut oil ACV possesses an array of antibacterial, antiviral and antifungal properties as well as pectin and natural acids that are known to help rejuvenate the skin. ACV also contains an antioxidant known as beta-carotene that helps to improve the renewal process of the skin cells when applied topically.